As you may have already read in the news Commander Selvam is “accused” of separating money from his flock (link). It is important to note that he is innocent till proven guilty. However this does bring up an interesting set of questions regarding “god men/women” and their ability to influence people by exploiting their fears to amass large sums of wealth. If you have not heard of Commander Selvam he is a self anointed Godman (About) who promises various cures and remedies with a combination of religion and pseudoscience, and has been instrumental in the construction of various Hindu temples in North America. Up until his recent fall from fame he was a very popular figure amongst the Indian American community and his magazine ‘Karma’ was a free pickup staple in all Indian grocery stores. The website (Link) makes for amazing and hilarious reading. Makes one wonder what Vedic Ritual costs US$10Million and a 100% “no return” policy! (Cut to Homer Simpson praying to God with a plate of cookies ” Dear God if you ‘don’t’ want me to eat these cookies give me NO sign”). b)The organization runs a ‘temple M&A’ operation that is surrealistic. 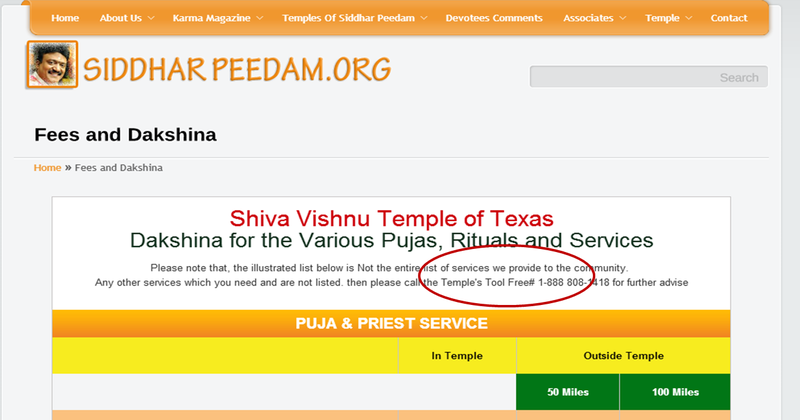 This is from their website – “Also, if you know any temple which needs financial support to manage the Hindu temple in any part of the Universe, we are ready to adopt”the temple and we will make sure that the temple will survive for generations. In any case, there are too many to name and list, you can find the entire offering here Link. Now that the Feds have indicted Mr. Selvam on 32 counts of swindling his congregation, credit card companies and the IRS, one wonders what is going through the throngs of “devotees” that have invested their faith, time and money with this Godman. Today God men/women are pervasive in every culture and country. Be it the Indian Guru that is pedaling pseudo science by mixing parts of scripture, yoga and medicine or the Pastor that purports he can heal the evil spirits of Satan’s minions that is the cause for homosexuality. The common themes always revolve around money, power and ability to influence, but most important of all is money. This Washington Post Article explores the rise of Indian Godmen and their accrual of wealth and power. However this is no different from the Jerry Falwells or Ted Haggards of this country. Same MO. a) You are required to attend religious sessions of ANY frequency (daily, weekly, monthly). (Entropy should be your friend here). b) There is a direct or indirect implication of monetary contribution of any kind. (dead giveaway – Your God person is getting richer by the day and you are not). c) You are absolutely convinced that he/she materialized objects right in front of you (or some other “miracle” that defied the laws of physics (also google- “image of Jesus on the tortilla chip”). d) You readily on board vague pseudo scientific concepts into your worldview ex. hugging a God person will bring you good luck, “getting a good view of the god person in a crowd’ is a sign of good times etc. e) You are very easily able to succumb to the cognitive dissonance that as long as there is evidence of “charity and social good” being implemented all other shortcomings/departure from law are fine. f) Finally…you lead by faith in places where you should have led by reason.